Having been thrilled by the BBC miniseries State of Play, I had to see the American movie this past weekend. The cast looked amazing and I couldn’t wait to see how the movie had been adapted and updated. The original came out in 2003 and a lot has happened in the world of print journalism, with papers folding and the Internet hopping. The story, now set in D.C., is still about newspaper reporter Cal McAffrey investigating the seemingly unrelated deaths of a congressman’s aide and a drug addict. Soon, Cal, with some help from colleague Della Frye, finds connections between the two stories and a possible government cover-up with deadly consequences. The problem is, the congressman at the center of these stories, Stephen Collins, is Cal’s old college buddy. The reporter must decide whether he wants the biggest story of his career at the cost of ruining his friend’s life. I wanted to do a comparison between the two versions so I called up my friend Eric, who has also seen both versions. PCN: I can’t tell if I’m not as excited by the movie because I knew what was going to happen, or because it truly has some flaws. Eric: I think it’s the latter. PCN: What issues did you have with the American version? Eric: I didn’t believe Affleck’s portrayal of Congressman Collins. The reason the character is the head of a committee investigating a military contractor is because he’s that rare white knight you find in politics who’s out to right wrongs and give the bad guys their due. The way Affleck is playing him, the congressman just comes across petulant. PCN: Yeah, I had major problems with his performance. Didn’t believe anything he did. There’s a blankness to him that he can’t seem to overcome. I didn’t believe him when he was angry, didn’t believe him when he was righteous, didn’t buy it when he was sad. David Morrissey was much more passionate in this role. I also had a huge issue with Cal and Stephen being college buddies when Affleck is 36 and Crowe is 45. What, Cal was held back a decade in college? Eric: And if you don’t believe the core relationship between those two, why bother with the rest of the story? PCN: Exactly. I will say, though, that I liked Crowe’s performance. He gave Cal a little more weight than John Simm did in the original. And there’s a mischievousness in Crowe’s eyes when he’s sparring with Helen Mirren or Rachel McAdams that we don’t often see in his performances. Eric: Those lighter moments from Crowe just came off as manufactured and full of pregnant pauses that announce, “I’m ACTING NOW.” And I’m speaking as a fan of Crowe’s past work. PCN: Oh, I didn’t feel that way. I liked how he toned everything down as opposed to giving us the full Crowe ballast. Eric: You mean how he didn’t throw things or hit anyone? PCN: Well, that and never shouting at anyone. He barely raised his voice but still managed to exude intensity. Eric: The intensity was low and the stakes weren’t high enough for me. Eric: Instead of the major conflict being about fuel sources like the original, they made it about the privatization of military forces and corporate espionage. PCN: And you don’t care about that? Eric: Fuel hits me where I live. I don’t care about the privatization of Homeland Security right now. PCN: Good point. Did you find the movie suspenseful at all, knowing all the twists ahead of time? Eric: No. I couldn’t help thinking over and over the miniseries did it better. But to be fair, they had six hours to do it in as opposed to two and change. I felt like the miniseries shouldn’t have been adapted into a movie because it sold the story short. PCN: I was fine with some of the stuff they left out, like the affair between Cal and Stephen’s wife, Anne. They spent a lot of time on it in the series while in the movie you’re just told that it happened. I also found the movie quite suspenseful in parts. The scenes where Cal ran into the killer in the apartment hallway and being stalked by him in the parking garage—those were super tense and weren’t in the original. Eric: Those scenes were great, no argument here. PCN: But I didn’t like how they made the black kid who was shot in the beginning a drug addict. Eric: Yeah! That was too easy. Eric: Nighy was allowed to show how and why he’s the editor. He’s cagey, wily and always on top of his game. Mirren’s character, while no doubt intelligent, is only allowed to throw up her hands in frustration for most of the movie. PCN: Her character was really cut off at the knees by the new owners of the paper, whereas Nighy’s Cameron was ballsier and fought the money guys in upper management more. Plus, Nighy had some hilarious lines while Mirren’s Cameron was humorless, which is not something you want to do to Mirren. Eric: Yeah. As for McAdams, this is the first time I’ve been unimpressed by her. PCN: I think the problem was the way the role was written. Her Della was a little more whiny in the beginning than Kelly McDonald’s portrayal. McDonald’s Della was plucky. Granted, McAdams’ character is a gossipy blogger instead of a “real” reporter. Eric: Yeah, that was kinda lame but I guess it created some conflict with Crowe’s character. PCN: I understand why they made her a blogger; it’s a statement about how old-school journalism is dying. This movie is a valentine to the passing era of investigative reporting. This is a theme also addressed in Michael Connelly’s new book, The Scarecrow (click here for my review), and it makes me sad. I like reading the news by actually holding a paper in my hands. Eric: But that end-credits sequence showing the paper going through the printing presses made the process seem so antiquated. And all I could think of was how many trees were being cut down. PCN: You have a point but I love having my paper. It’s a tradition I’m not ready to give up yet. I love going out in the morning and finding the paper on my doorstep. Love reading it over breakfast, flipping the pages, not clicking on them. I also wrote for a paper a long time ago and loved the thrill of seeing the final product in the morning, how many inches you got and what artwork the editors gave you. If you press “send” and the only place where you can read your article is on the same monitor you used to write it, it’s anti-climactic. Eric: But you’re writing a blog. PCN: I don’t write hard news and am not a reporter anymore. If I had Oprah’s money, though, this would totally be a weekly entertainment paper or magazine. But we’re getting off track. Would you recommend this movie or not? Eric: I’d say wait for the DVD. And while you’re waiting, check out the BBC version which is already available. PCN: I’d recommend this movie. It may not be as strong as the original but it’s still smart entertainment and we need more of that. Thank you for the spoiler alert, PCN – I stopped reading there. Even without having seen the movie, I agree about the age difference between Russell Crowe and Ben Affleck. There’s no way I’d buy them being at college together. I went in and put an END SPOILERS so the article is safe to read after that (if you still want to). 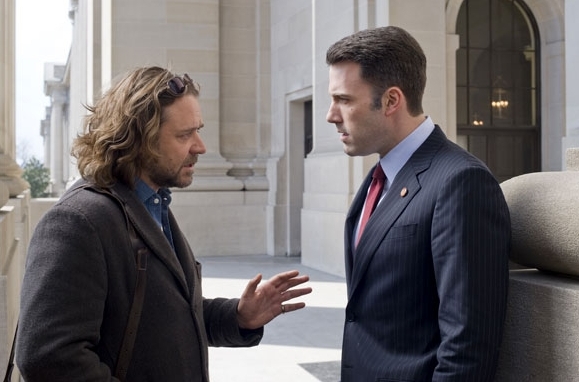 Like my friend Eric said, the relationship between Affleck’s and Crowe’s characters is the core of the story so if I can’t even buy the simple setup of how they met, it’s kind of a problem. In the BBC version, the reporter befriended the MP when he worked on his campaign. Thanks, ShelleyP. I’m grateful for smart, good-looking readers like you who have impeccable taste! Thanks for the review, PCN. I am a huge fan of most everything the BBC puts out and I just happened to have caught the miniseries on dvd and loved it! No offense, but the Americans usually screw things up when they try to re-do a British story. Really sad state of affairs. Might have something to do with payback from the tea party incident. Seriously though, why is Hollywood so devoid of good material these days? Seems like the only good films have to be hunted down in the wilds of arthouse fair. I think good material exists but the people who hold the purse strings don’t necessarily want to throw money at it. They’d rather go with a sure investment, which means we’ll probably be subjected to Hannah Montana: The Sequel.